Which instrument are you most interested in learning? Thank you for choosing Lakeland School Of Music! Someone from our admin office will contact you in the next 24-48 hours with more information. This question is often asked by prospective students. Our teachers make it a priority to get to know you on a personal level and to become familiar with your personal musical needs and goals. We do not treat every student the same in terms of what and how we teach. 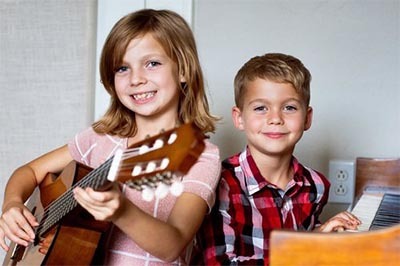 A seven year old having their first guitar lesson will have very different needs than a fifty seven year old taking up piano for the 2nd time after having had lessons as a child. The main reason to choose Lakeland School Of Music as your music lesson provider, is that we are sensitive to the fact that every student is an individual. We teach all styles from rock, pop, jazz, country, blues classical, and more. Our teachers are diversified in their abilities, and if there is a particular style of music you are wanting to learn, we can help you achieve your goals. Our guitar teachers teach all styles, including rock, blues, metal, jazz, country, and classical guitar lessons on electric and acoustic guitars. Beginner students can expect to work on chords, simple songs and melodies, sight reading and theory. We balance musicianship and fun by making sure that each lesson you are challenged with a new technical or theory concept, but always end with something fun such as your favorite riff or song. We use a variety of guitar method books to accomplish this and encourage students to bring CDs or their iPod to their lesson to learn their favorite tunes. Our piano teachers teach a variety of styles from classical to popular music. Whether you want to learn Bach, Alicia Keys, or become a worship leader at your church, our teachers are happy to help you become the pianist you want to be. Our piano faculty will show you the fundamentals of sight reading, technique and theory, but they will also incorporate your favorite songs into your lessons. You do not have to have a piano at home to take lessons. A simple full size electronic keyboard will suffice for the first 6-12 months. Our piano teachers have warm personalities and enjoy sharing their love for the piano with you..
Our voice teachers primarily focus on popular music and/or classical. If you have always wanted to be a better rock, pop, country, jazz, gospel or R&B singer, then we have the right voice teachers for you. Voice students spend time each week doing vocal exercises to improve their vocal range, ear training, breath control, vibrato, tone production, enunciation and more. All voice students set goals with their teacher to work on sounding like their favorite recording artists, or if they prefer, to develop their own unique voice. We not only teach singers, but also local TV and radio personalities who want to enhance their speaking voices. We believe in giving our students as many opportunities as possible to share their musical talents, no matter how young in age or skill level they may be. With two formal recitals each year, Open Mic Events held every 8-12 weeks, community events such as 1st Fridays, Satur day Markets in Downtown Lakeland, National Children's Day Festival in Munn Park, Platform Arts for Kids, Platform Arts for Adults, solo artist showcases for the National Anthem at Florida Tropics soccer games, and much more, our students get a unique opportunity to grow in their musical gifting through these regularly held performances, which can be contributed to why so many of our students continue on to Harrison School Of The Arts, private and state university music programs, and the pursuit of careers in music performance and music education. Jam Bands are a great way for students to grow in their musicianship by playing music with their peers in a live band! Band rehearsals are 60 minutes per week, and each band performs in our Open Mic events, Recitals, and special community performances held throughout the year. Not only are Jam Bands a ton of fun, but they're a great way for students to interact with their peers, while learning the foundational skills that are so important for their growth as musicians. Students must be enrolled in private music lessons at LSM to participate, and 12 months of lessons is recommended but not required. Private Lessons (Option 1) - $28.50 per 30 minute session held once per week. Includes full access to all performances, annual portrait day, and weekend music classes. ($114 per month). Private Lessons (Option 2) - $55.00 per 60 minute session held once per week. Includes full access to all performances, annual portrait day, and weekend music classes. ($220 per month). When you refer a friend or family member to Lakeland School Of Music, you receive a $25 visa gift card to spend anywhere you'd like. There's no limit to how many referrals you can be compensated for which means if you refer 4 new students in one month, you've basically just won a month of free lessons, and you can do this as many times as you'd like! One of the ways our business has grown so quickly in such a short amount of time has been from loyal clients like yourself, simply sharing with friends and family how much our business has impacted their lives. Please ask for more information if you're interested in participating in our Music Lesson Referral Program. Monday through Friday 9:00 a.m. to 8:00 p.m. Thank you for contacting Lemon Street Music, an administrator will contact you within 24 hours to schedule your trial lesson. Lakeland's Premier Source for music lessons in guitar, piano, voice, violin, drums, bass, flute, trumpet, mandolin, ukulele, and more!